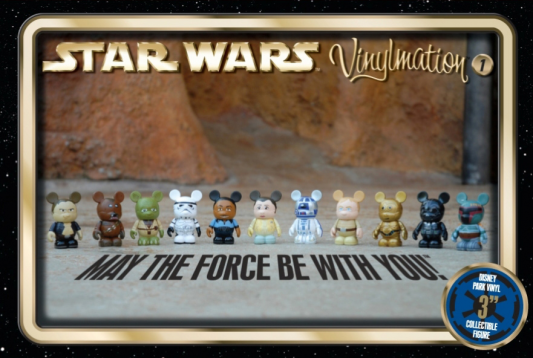 Vinylmation – Star Wars Series #1 is coming to Disney theme parks in Florida and California this weekend. If you’re not familiar with Vinylmation, these are collectible designer toys created by Disney Theme Park Merchandise, sold only at the Disney theme parks. Characters like Darth Vader, Yoda, C-3PO, R2-D2, Boba Fett, and more will be part of this first Vinylmation – Star Wars Series. There will be a midnight release party tomorrow night (Thursday, January 13) at D-Street at Downtown Disney West Side at Disney World in Orlando, FL. Disney Design Group artist Mike Sullivan will be there until 2AM to autograph the collectibles. On Sunday, January 16, Sullivan will be signing at D-Street at Downtown Disney in California from 2PM to 5PM (D-Street will open at 8AM that day).